Lindsey Pulliam races down the floor. The sophomore guard was the Wildcats’ leading scorer in the Duel in the Desert. Northwestern suffered its first loss of the season in brutal fashion Thursday, losing 52-49 to Pittsburgh in a game that spent three quarters making a mockery of the concept of offense. The Panthers (5-4) picked up their first road win since Feb. 1 while the Wildcats (5-1) finished with their lowest point total this season. Entering the fourth quarter, Pitt and NU were averaging 10 and 9 points per quarter, respectively. 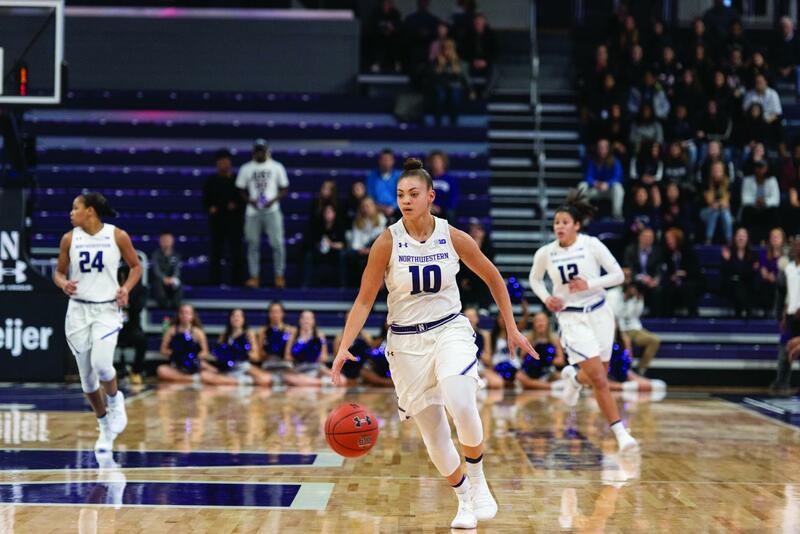 The Cats, who were missing junior forward Abi Scheid and freshman guard Veronica Burton, put on a performance reminiscent of their disastrous 2017-18 campaign, finishing with the same amount of turnovers as made field goals (15). Not to be outdone, the Panthers were just as bad — finishing with 18 turnovers and 18 buckets of their own. Pitt shot 35 percent from the field, but fortunately for the Panthers, they held the Cats to just 26 percent from the field. Kunaiyi-Akpanah was the lone bright spot for NU on Thursday, putting up 16 points and 10 rebounds to lead NU in both categories. It was a brutal day for sophomore guard Lindsey Pulliam, who leads the team in scoring, as she went 4-for-18 from the field. Pulliam had a chance to redeem herself late, as she got an open, potentially game-tying look from the three-point line with 22 seconds left. The shot came up short, leaving Pulliam 0-for-6 from deep on the night, and Pitt’s ensuing two free throws put the icing on the Cats’ first loss of the season. In addition to missing Scheid and Burton, Joe McKeown’s squad lost sophomore guard Jordan Hamilton to an injury midway through the third quarter. Junior guard Byrdy Galernik and junior forward Bryana Hopkins struggled to run the offense in her absence. McKeown, however, refused to use injuries as an explanation for his team’s disappointing performance.